Prominent Egyptian activist and blogger Alaa Abd El Fattah, an icon of the Egyptian revolution, was sentenced to five years in prison today for allegedly taking part in a protest and “assaulting a policeman and stealing his walkie talkie.” He was also fined 100,000 Egyptian pounds (13,000 US dollars). The verdict was delivered a few minutes after the hearing opened. It was received by chants from angry relatives and journalists calling for the overthrow of the military regime, now in control of Egypt. 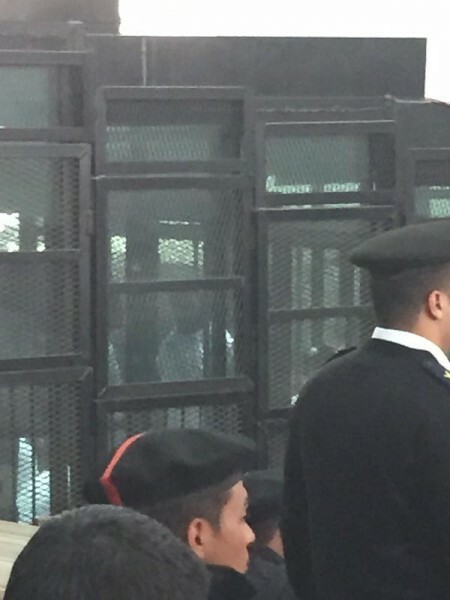 The saga came to a complete circle today, with the new judge issuing a five year jail sentence against Abd El Fattah and another defendant Ahmed Abdel Rahman, who was passing by the protest, and was arrested along with Abdel Fattah, as he was helping some girls who were being harassed by the police. Abdel Rahman was also slapped a similar fine. Eighteen other defendants were sentenced to three years in prison and three years on probation, in addition to a similar fine. Mohammed Aziz shares a sound bite of the verdict (Arabic) and its aftermath on SoundCloud here. Abd El Fattah has been jailed or investigated under every Egyptian head of state who has served during his lifetime. In 2006, he was arrested for taking part in a peaceful protest. In 2011, he spent two months in prison, missing the birth of his first child, Khaled. In 2013, he was arrested and detained for 115 days without trial. And he now faces five years in prison. Abd El Fattah has long worked on technology and political activism projects with his wife, Manal Hassan. He comes from a family of prominent human rights advocates. His father, prominent human rights lawyer Ahmed Seif El Islam, was jailed multiple times under the regime of Hosni Mubarak. Alaa was detained when he died. Abd El Fattah’s sisters, Mona and Sanaa Seif, have both faced censure in connection with their activism on military trials in the country. Sanaa Seif is currently in jail serving a three-year sentence, also for allegedly violating the controversial protest law. On social media, Abdel Fattah's sentencing caused an uproar. علموا ولادكم ما يقفوش يقولوا كلمة حق، ولو شافوا ناس مستقووين على ناس في الشارع يبصوا الناحية التانية، ومصر هتبقى قد الدنيا. Teach your children never to stand up for justice; if they see people bullying others on the street, ask them to turn to the other side. And Egypt will be mighty. The right to peaceful demonstration remains one of the most significant barometers of government authoritarianism in the Arab World. Has anyone ever been sentenced since 2011 with any relation to the revolution other than the revolutionaries? Despite a “revolution” activists continue to be punished for their work in an equally autocratic Egypt — an Egypt they created by leading demonstrations which called for the overthrow of the previous regime. The Shura Council case will now go to the court of cassation, prolonging an agonising saga which started in November 2013.